If you have anything to do with professional blogging, image editing is one of the those things you cannot ignore. Images play a central and vital role in blogging. There’s no denying that a sophisticated and proportionate use of images make a blog post not only attractive but also engaging. Experiments show that the posts which have a good number of logically used images interest users much more and this obviously benefit bloggers. And the equation is very simple, if a visitor likes the content of your website, it is more than likely that he would visit the website again. It all results in ever increasing subscribers. Guys, if you do not have appropriate image editing tools, it will be hard or impossible to present tutorial and tutorial-like blog tools where images form the bulk and core of the content and not mere an embellishment. For example we are writing an article ‘how to install a WordPress theme’. So in this tutorial we need to depict step by step images of the process of installation of a WordPress theme. To this end, we need an screenshot maker software which allows us to capture any part of our PC’s screen. Once you have taken screenshot, you now need to annotate the captured image like adding arrows, some text and watermark, blurring some parts and highlighting some parts etc. 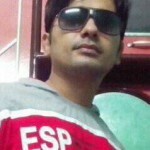 Besides, there are many other things too which you may want to do such as adjusting size of an image, compressing an image, sharing a captured image with different people for the purpose of technical support. So here in this post we will have a look on all those tools which if you harness, you will feel a difference for yourself and your image related productivity will for sure soar. Picpick is a completely free image editing, screen capture and resizing tool. With the help of Picpick, we can capture anything on the screen, capture scrolling window, capture region, capture active window and much more. With Picpick, you can add effects to a captured screenshot or an image you have opened in it. Picpick provides a vast array of image editing features such as drop shadow, motion blur, pixelate, brightness control, mosaic effect and much more. You can add text callouts, arrows, curved arrows, shapes etc. It is the most comprehensive free tool to create screenshots and edit them with most of the basic image editing features such as adding text callouts, arrows, cropping and much more. With the help of this PC software, you can upload a created screenshot within no time to cloud services like Google Drive, Onedrive, Dropbox etc. Even images can be uploaded to Imgur and Imageshack to quickly create an online link to that image. PicPick is more than an screencapture tool. It lets you apply graphical effects such as drop shadow, frames, watermark, mosaic, motion blur, brightness etc. Other than adding cool effects, you can annotate and highlight your images with simple arrows, curved arrows, text callouts and much more. There are several readymade arrow, shapes and text callouts are available. In addition to all these awesome image editing features, this 100% free screen capture tool comes with several graphic and web designing accessories such as color picker, color palette, pixel ruler, magnifier, whiteboard, crosshair etc. Image annotation tools like text, text callout, arrows, bezier curve arrow, readymade shapes, watermark, stamp, number steps etc..
Lightshot is a simple screen capture and sharing tool which, using their own cloud prnt.sc and other cloud services, lets you share a captured screen region quickly. Lightshot offers only capturing full screen or a rectangle region and comes with basic image annotation tools like free hand pen, arrows, marker and text. Lightshot is a tiny but very useful app that provides you fastest sharing so that you are able to share screenshots among your team swiftly. It comes with a dedicated one click sharing to its own cloud service. Additionally, you can find images similar to your screenshot (Lightshop utilizes google image search for this purpose). 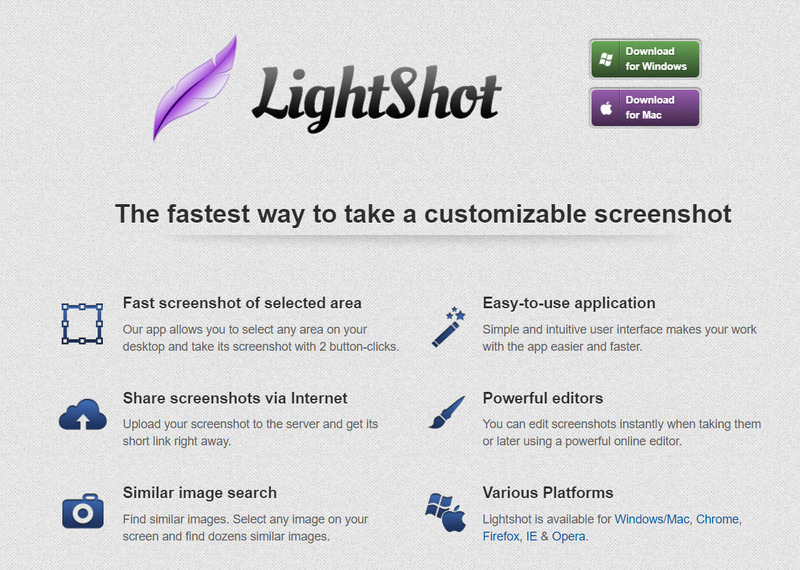 And as a cherry on the cake, Lightshot is available for Mac OS too. 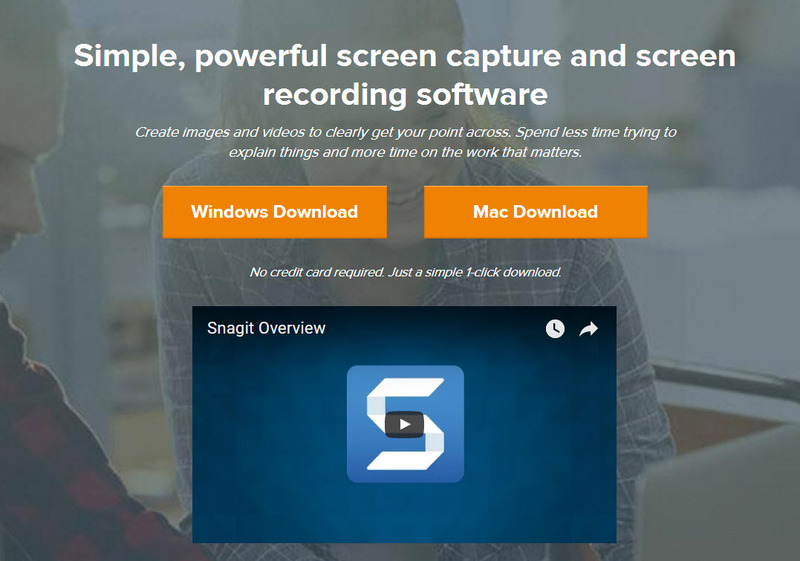 Snagit is a screen capture tool that can be said undoubtedly the best and easy to use screenshot maker tool for both Windows and Mac. Snagit is not a free tool but believe me it’s worth it. Snagit is my favorite tool to capture, edit and annotate images. If you can spend some bucks, you will make the most out of your screenshot making skills. Snagit comes with lots of amazing image capturing, editing, annotating and sharing features. Let’s start from its screen capturing features. 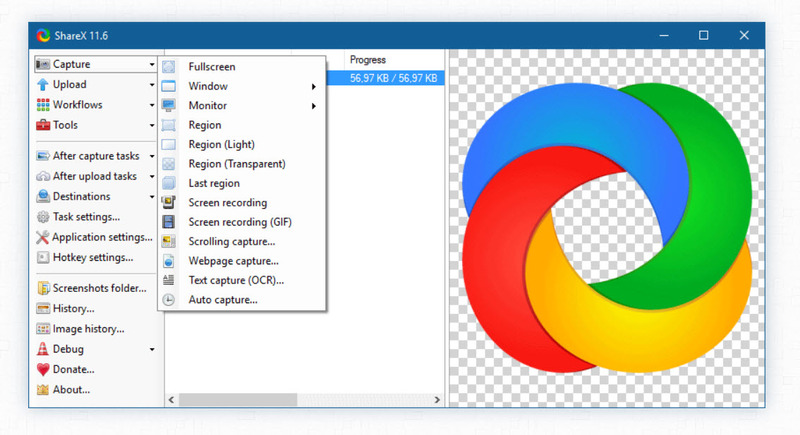 Panoramic – It is a special Scrolling Window capture feature. Select a region on screen and start scrolling the screen. Panoramic mode captures the entire scroll passing through the selected region. Capture objects like PC icons, different windows etc..
Can you come up with a software which can provide such a great number of diverse and innovative ways to capture a screen? I don’t think so. If you know a screen capturing software with all the mentioned features or more, please let me know in comments. A free application of Snagit is available for both iOS and Android. You can capture a screenshot of your mobile phone’s screen with these apps and using WiFi simultaneously launch the screenshot on your desktop’s Snagit editor. When it comes to Cloud sharing, you can take my word for it: Snagit is perfect. Yes, I mean it. You can send created screenshots at once to Cloud services like Google Drive, Dropbox and even FTP. At the same time, Snagit comes with its own Cloud sharing service, which is screencast.com. The screenshot you capture is immediately uploaded to Screencast and Snagit editor provides you an internet link of the image, which makes screenshot capturing a live, jaunty and smooth experience. Now let’s have a look on the rich array of annotation tools provided by Snagit editor. The annotation tools which you get with Snagit are cutting edge and highly advanced tools with a vast variety of options to customize each and every tool. Snagit brings you an immense number of options such as simple text, callout text, simple arrows, Bézier curve arrows, readymade stamp icons, number steps, blur tools, erase tools, highlighter magnify tool and crop tool. Snagit developers seem to have made their mind that they will leave nothing to be desired. Watermark embedding is another important tool. With Snagit editor, you can add a watermark to an image real fast. You can set your your own graphical watermark on any part of the image and create transparency and embossing like effects also. The great thing is that if you buy it, you are eligible to download both Windows and Mac versions and there is no need to have different license keys for Windows and Mac. If you make a living from online business and need something professional I highly recommend that you buy this product i.e. if you want to go professional and want to have some corporate feeling you should choose Snagit, otherwise free tools like PicPick or Lightshot are always happy to help you and will hardly ever disappoint you. But there are some things that I desperately feel Snagit leaves to be desired and these are color picker and measurement scale tools. These tiny but very important tools are available in PicPick. Ashampoo Snap 9 is almost as powerful screen capture software as Snagit and it works in many ways almost like Snagit. Features of Snap 9 and Snagit do not differ much. If in one feature Snagit seems to be outstripping Ashampoo Snap, it is quite possible in another feature Ashampoo may be winner. As far as being user friendly is concerned, Snagit is much better than Ashampoo Snap. Ashampoo’s workspace is a little bit confusing and it may take some time for you to get the hang of it. Besides, many annotation tools offered by Snagit like text boxes and arrows are better than those provided by Snap. On the other hand, Ashampoo showers you with many extra tools such as OCR capture (image to text), color picker, spotlight creator tool and many more options for shape and text. But if you are of two minds whether to choose Ashampoo or Snap and Snagit, my recommendation is Snagit. 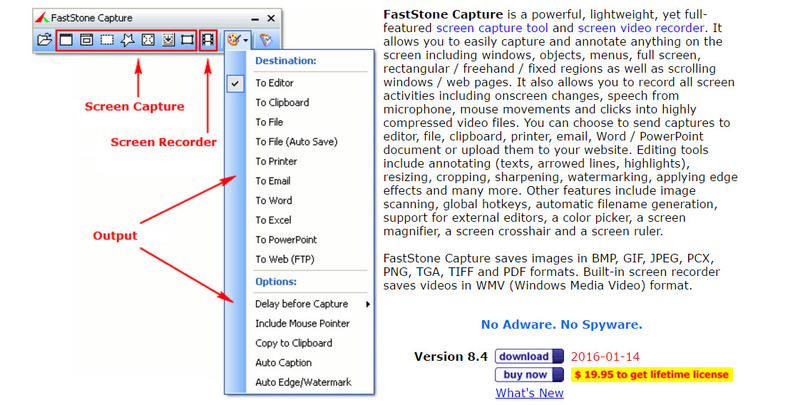 Faststone is a tiny but powerful screen capture and editor software. Few years ago this software was developed as freeware and I used its free version for a couple of years. Later on it became a paid utility. With the help of FastStone, you can capture a screen in many ways. You can capture a full screen, rectangle region, freehand region, PC window, scrolling window and then annotate the screenshot using text, shapes, arrows. But to be honest, Faststone can’t be a match for Snagit, Shampoo Snap or PicPick. ShareX is much advanced screen capture software and the best thing is that it is for free. 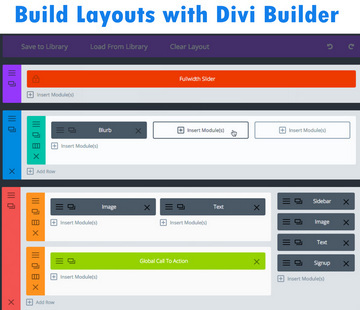 With the help of this Windows software, you can get different kinds of screenshots like full screen, rectangle region, scrolling window etc. Even ShareX allows you to record a screen. ShareX offers many tools also for editing and annotating such as crop, rotate, shadow, border, blur, arrow, text, steps, watermark etc. Not only that, if you want to go to a little higher level, ShareX still doesn’t disappoint you as it comes with advanced photo effects like color adjustments and photoshop like filter effects. But the one thing that I don’t like about ShareX is its user interface, which in my opinion is neither well-organised nor attractive. But then, it is free software and offers more features than you can expect from free software.